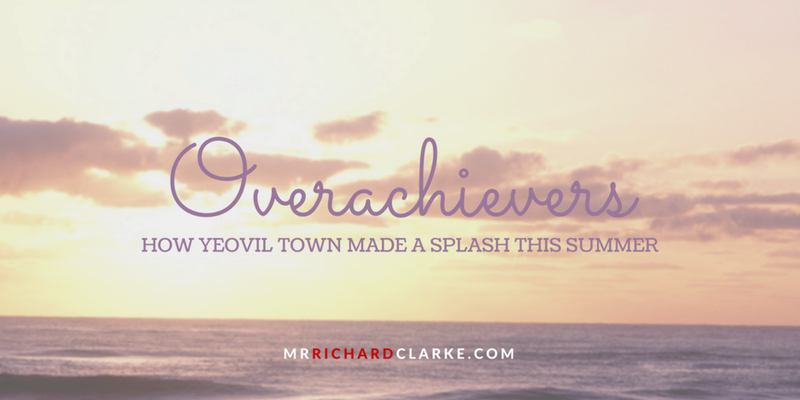 In sport and digisport, it is important to focus on the overachievers. Whether it is Billy Beane’s Oakland As, Claudio Ranieri’s Leicester City or, dare I say it, Ryan ten doeschate’s Essex CCC, there is a lot to be learned from those who have beaten the big boys with a fraction of the finances. That is why I wanted to speak to people behind Yeovil Town’s social media accounts. We’ve read ad nauseam about the ingenuity of many club’s announcements over their summer signings. But none received more plaudits, relative to their resources, than the League Two side from Somerset. They produced a host of inventive signing announcements that helped the club garner 9.7m impressions during the summer period. Lewis Hancock, the club’s Digital Media Editor, told me the story…. RC: Yeovil Town created a significant amount of cut-through with their player signing announcements this summer. At the start of the summer, was it a deliberate plan to exploit these moments? LH: Not initially, no. We had saw Everton reveal their first signing in a unique, seamless video and thought we would try it for Rhys Browne. After that, we decided we would up our game and attempt to be creative with every announcement. RC: Tell us about your department, the skills/backgrounds the personnel they possess and the resources you had at your disposal? LH: There are two of us in the media department. Myself, the digital editor, formerly of Bristol City, and press officer Alex O’Loughlin, who is in his first football role. We’re both 24-years-old so we’re on the same wavelength with regards to most things social media-based. Being at a club like Yeovil, we don’t have a massive media budget so we need to be more innovative. Alex and I both have a background in video and are capable of creating such content. RC: While resources are hugely important, how did you turn the lack of them to your advantage? LH: We just did what we could – it’s as simple as that. If we thought of an idea and thought we could run with it, we would give it a go. Some ideas were more popular than others; some worked, some didn’t. RC: Tell us the story of creating the Snapchat location reveal? LH: I’d just updated my Snapchat due to the new maps feature. I was clicking on bitmojis to see who my friends were and something clicked! I knew we were signing Jake Gray the next day so presented the idea to Alex. He was unsure at first but I was adamant it would work. We set up a fake Snapchat account for Jake and with two phones and a Macbook, we went to work. Jake recorded a message on his fake account and we recorded this rest onto the Mac. It worked really well and we were thoroughly pleased to be talked about in the same breath as teams like Arsenal, Roma and Liverpool. LH: We racked our brains to come up with new ideas and FIFA 17 was one we toyed with. This time, I was unsure but Alex was positive it would create a lot of interest. He was right. Once again, the footage was recorded onto a Macbook and thankfully Olufela Olomola, our centre forward, agreed to the loan on the game otherwise the idea would have had to have been scrapped! RC: Did you bring any principles to the creation, a Yeovil Town ethos or brand behind what you created? LH: Not particularly. It was more of a case of if it worked, we thought it would generate interest and raise the club’s profile then we’d do it. RC: What was the buy-in from the club’s players, management and directors before you did this? LH: Everyone loved it, especially the players and management. Our board is formed of a lot of older gentlemen so they don’t really understand it. However, they knew we were doing a good job! Manager Darren Way suggested potential announcements as did the players. It got the club’s and players’ names out there; we were getting messages from all over the world. That wouldn’t normally happen with a club of our stature. RC: What effect has this summer’s player reveals had on the club? LH: It’s raised our profile. We’ve had a lot of interest from the media and have been compared to huge clubs across the globe. Our Twitter followers have risen by around 7,000 since June which is an incredible increase. I think everyone expects us to continue in the same way and is excited for what else we’ll produce. The club was also nominated for Fanalyse’s Best Fan Engagement award 2017. We didn’t win but it was an honour to be shortlisted alongside Premier League sides West Ham and Brighton, and Championship outfit Sheffield Wednesday. RC: Can you go back to ‘normality’ now? And, if not, where do you go? LH: We can, but who wants normal? We have to continue to try and be creative and keep building on the good work we’ve already done.